On Pingala, magic is king. Literally. King, or Queen, depending on which of the six species you belong to. But magic only extends so far. Within 10 miles of the location of his or her Royal Highness, to be exact. The Royal Circle, this area is called. All the magic-dependent species - human, Aridizan, Byndari, Flyer, Katipo and Nasuchu - find the Royal Circle limiting and frustrating. But all that's about change. At the next solar eclipse, the Kings and Queens, together, can perform a ceremony to spread access to magic power across the whole planet. But there's a problem. A powerful Sorcerer is using human Retrographs as conduit for threatening to not only stop the ceremony by killing the King, but also completely wipe out magic on Pingala. If magic is destroyed, the species will go extinct. No magician was thought to be powerful enough to change any Retrographs, never mind the hundreds of thousands that are affected. Humans are panicking, afraid and angry at this unknown Sorcerer. For nineteen-year-old Benjamin Skyhammer, a rare human born without magic power, the threats are a particular problem. First of all, the ceremony would give him the magic powers he's wanted all his life so he can finally be accepted by human society. Second, Skyhammer is the Keeper of the Retrograph Vault, the only human known to be able to see other people's Retrographs. Implicated in the threats to the ceremony, Skyhammer, now a hunted man is determined to find and stop the Sorcerer. With only 6 weeks and whole planet to search for the most powerful magician Pingala has ever known, Skyhammer must solve the mystery of the Retrograph Sorcerer before his chance at magic power vanishes forever and all the species on Pingala are destroyed. 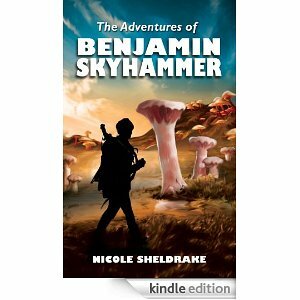 Nicole Sheldrake has created a wonderful world full of magic and adventure. Her ability to create a world that is so realistic that the reader feels as if they are traveling along with the characters is one that can only come about through pure talent. Benjamin is one of two humans lining on Pingala with no magic. He is looked upon as a freak. This character reminded me of Mira in Jason Lett’s series Powerless. In that book the characters all have a type of superhero talent except Mira. Benjamin has a high position. He is keeper of the Retrograph Vault. Every minute a snapshot of a human’s life is taken with the equivalent of their third eye. They are able to create a whorl, which I equated to a mirror to look at those snapshots. No one can see anyone else’s retrograph, except for Benjamin. He can see everyone’s. When he is not working in the vault, which is seldom, he is on a quest to find relics to sell to collectors. He does this hoping to find the ultimate relic, a glove that will hopefully give magic like everyone else. Someone powerful has broken into the vault and altered the king’s retrographs. Now Benjamin has a new quest. I loved the characters. There were six species on Pingala and the author did a wonderful job of fleshing them out. They aren’t described to you, you learn about them in their natural settings through the actions and interaction with Benjamin and Higgins. This is the first book in her series and I like many others will be looking forward to the next.